Hey everyone, this is Brian Copeland – lead singer of Euphonic Dissonance giving you a long overdue update. After more than a year away from recording Euphonic Dissonance songs we are back in the studio working on new material. Here is what we hope will be the first of many new tracks. Hope you enjoy listening to this fine cover of Neil Diamond’s “Solitary Man”. This is only a rough draft for now without vocals or guitar. Be sure to comment and tell us what you think of this new song and stay tuned for new news from ED. This interview was recorded March the 24th of 2011 at the Cherry Street Coffee House in Tulsa, Oklahoma. 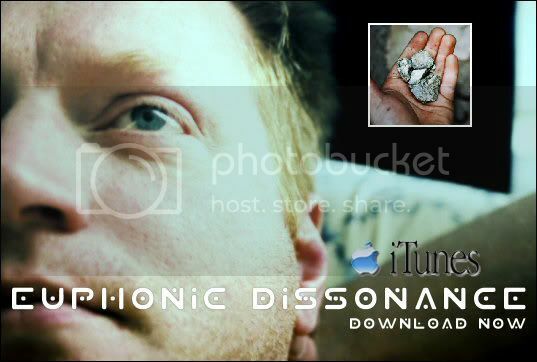 I’m Brian Copeland – lead singer of the progressive industrial group Euphonic Dissonance. I’m conducting this interview with Axis to expose people to other great industrial/electronic bands from our home state of Oklahoma. Axis has shared the stage with some of the most influential bands in the industrial and electronic genres. These include Slick Idiot, Mankind Is Obsolete, Lords Of Acid and My Life With The Thrill Kill Cult. Filled with meaningful melodies and emotional depths, Steven Blackwell’s programming, producing and studio sound experience along with Vixx’s resonating vocals combine to create their unique sound. I’m having coffee with the members of Axis in a back room of a very busy and – needless to say – noisy coffee house. Let’s meet the members of this mind warping electronic rock band – Steven and Vixx. Brian: Steven and Vixx. Steve Albini once called industrial music disco through a fuzz box. This type of music came into style in the early 90’s and is now 20 years old. Some would go as far to say that industrial music is dead. Give us your take on the current state of the industrial music scene. Steven: Um, it seems like it’s going pretty strong right now. It’s picking up a little bit of momentum as of the last 6 months to a year. It’s hard to say with the music industry as a whole being on kind of a down curve but I think it’s not dead at all. You can look it up and search it on any given search engine and you’ll pull up a ton of bands. Some of it good – some of it bad – but dead? I don’t think it’s dead. Brian: So you think it’s just the economy? Steven: I think it’s just the economy and the music industry as a whole. Vixx: With things being so accessible online it’s a lot harder for bands to generate any business for themselves. Brian: That’s true and it seems that a lot of it is no so much album sales as it is singles sales. You guys find that you’re having to put out a lot of new songs just to keep up with things as they are? Steven: Sort of. With our new EP out that was kind of where we were going with it. We figured and EP would be a good way to get back into things and try to make some money off of it. Try to get our music out there and it’s a lot easier with a single or an EP than try to just release an album. Brian: What is Axis doing that is different from previous industrial oriented groups? Steven: I don’t know. I’d like to think that we’re a little bit more creative than a lot of stuff that has happened over the last several years. I like to say that I’m musically A.D.D. and so I can’t stick to one particular style for too long. The EP is a little bit more of a narrow version of what Axis really is. We have an upcoming album – it should be out in a few months – and it’s going to be pretty all over the place. Vixx: We like to write things that are more personal to us and things that we feel have a little bit more meaning than just the surface – dance hits. Brian: You just released a new EP. What’s the name of the new album and what will people hear when they download the new EP? Vixx: Okay, well, the reason we decided to name the EP POLAR is because we had these songs that we had made but we didn’t like but they really didn’t fit on the album. They were just a little more on the surface than going into the depths of the actual album so we decided “let’s just throw them on an EP” and since they’re a little bit different we’ll call them POLAR cause they’re not so much the opposite of what we’re doing on the album but they’re definitely different. Brian: So, not so much B-sides as just different? Brian: Right. Okay. How is the current EP different than the previous LP album? I think you kind of covered that just then. Steven: Well, the last album we released – we had a five piece band and it was a lot more rock oriented. So it’s different in that the EP is pretty straightforward electronic. The next album is going to be more rock oriented. It’s going to be a good mix of electronic and rock. Whereas these songs stuck out as being overly gritty and electronic – so then I thought – well, we’ll just stick these songs together on an EP as it just made more sense that way. But yeah, the previous album is much more guitar based drums – you know rock band with a decent amount of electronics. Brian: You say that’s the full five piece band. I gotta assume losing the full five piece band has considerably changed the sound. Has it caused you to stroke out in a different direction? Steven: A little bit. The next full length album’s gonna sound a lot different in that the musically production has evolved a lot since that first album but the overall sound in some ways isn’t going to change a whole lot. I like staying in the vein of electronic rock I guess because if you classify yourself as an industrial band too much people have an expectation. Say something like electronic rock and people don’t know what to think of that so it gives us a broader umbrella of what we can do. Vixx: I’d say it’s quite a bit different because on the last album I wasn’t involved in the music writing process at all and now it’s just the two of us. It’s a lot more focused and a lot more of just our ideas without having to go through five other people to agree on something and try to get a little bit of everyone’s input in. It’s kind of more of a collaboration of just the two of us and we’re very similar in our tastes. Steven: Actually, it’s much more focused. That’s a really good way to sum it up. It’s gonna be a lot more focused than the previous album. Brian: My favorite song from the new EP is BURN. Can you give us some insight into what prompted the creation of this particular track? Steven: Ah.. man. I’d like to say there’s some really awesome back story but really I was just super pissed off one day and got home and wrote a song. Brian: It kind of sounded that way. I think that’s why I liked it. Steven: Yeah, it was really just written from a bad day. I had been working on a couple of sounds and a couple of patches. Just kind of pieced it together over the course of a day – ran it by Vixx – she really liked it so I moved forward with it and it kind of evolved over the course of a few days. Brian: That’s my favorite song. What’s your favorite song off the new EP? Steven: Ah, that’s tough because I actually ended up liking BURN a lot. Vixx: We got a really good response from RX. A lot of people on the past couple of shows that we’ve done said that was their favorite song live. I don’t know if they’ve heard it recorded but it definitely got the crowd going. It was the best response that we’ve had from a song in awhile. Steven: Yeah. And I think TRASH is kind of the other favorite on the album because it’s more experimental. Out of the five tracks on the EP it’s the most experimental of the bunch and it’s a good combination of the two of us. Brian: What will you be working on next? Steve: We’ll be finishing up our album titled 23 DEGREES and we should have it out this summer. There’s no exact date as we’re still polishing up the recordings and finishing up all that. And since we’re an indie band we’ve got to pay for it. We’ve got a tour planned for June and July 2011. It’s pretty much an east coast tour of the United States. Hopefully a break after that. Brian: Do you have any concept of exactly where you’re going on the east coast? Vixx: It’s been set up for us so we haven’t got the full details on it yet. All we know is that we’re starting in Philly. Steven: Our booking agent just gave us the thumbs up on the tour two days ago. It’s something like two and a half weeks long. Starts in Philly and ends back in Oklahoma. Brian: Are you going on the road with somebody else or just yourselves? Steven: Yeah, we’re going on the road with Man And Machines. Brian: I’ve heard of them. Steven: Yeah, they’re pretty good. I like them a lot. Steven: We had just met our current booking agent. Apparently he really liked us so he immediately threw us on a tour that he had. They’re based out of Philly so we’ll meet them in Philly – go up the east coast and into the central U.S. and back down to good ol’ Tulsa, Oklahoma. Brian: Do you compose your music using hardware or are you more into the computer software thing? Steven: Oh man, you see, I could go on for hours and hours on that. I’m a total tech junkie. Both, uh, both is the short version. Vixx: Yeah. We still have our favorite hardware synths that we like to use. You can get a lot of different sounds from VSTs but nothing takes the place of pushing down all the keys and tweaking everything and getting it just the way you like it. Steven: We do record everything in software. There’s a lot of effects and some VSTs that are used in the process. We play bass, guitar and drums on some of the tracks so it goes back and forth. Brian: I don’t want to get too into a tech discussion because we’ll bore people to tears with that but I do have to say – I noticed you posted on Facebook that you got a new keyboard. Brian: Want to tell us a little bit about that? Steven: Ah man, I’ve really only got to spend a couple of hours cause we’ve been so busy. Since we got it we’ve maybe spent two hours with it. We just picked up the M-Audio Venom and I don’t want to sound like a commercial but the thing is awesome. It blew me away in the two hours that we did get to play with it. Just on the fly, it’s really cool in that it’s a good combination of hardware and software. It’s set up to where you can install the software on your computer and use the keyboard as a controller or you can use the keyboard as an independent unit so I’m totally loving that thing. Brian: M-Audio’s a great company for covering both side of that – with the computer and the hardware solution – which is nice. *looks at Vixx* Do you have any input on the keyboard? Vixx: I really like it because it has a few knobs but you can really get in depth on the software and import it back into the keyboard. So you don’t have to sit there and like twist the knobs and make sure they’re exactly where you want them. On the keyboard itself you can go in and click on it – turn it whichever way you want it – listen to it that way and then put it back on the keyboard to actually use. Brian: That would be nice – wouldn’t it? Stay tuned to our blog. You don’t want to miss the next episode of this spell binding interview with Axis. You can SUBSCRIBE TO OUR BLOG by CLICKING HERE. By clicking you can become a subscriber and learn about the time that AXIS tried to kill their audience during a live show but you’ll have to wait until PART 2 of our INTERVIEW WITH AXIS. Euphonic Dissonance is opening up more ways to keep their fans updated. You can now find us on ReverbNation.com. This dandy little site provides musicians with the ability to spam the crap out of anyone – anywhere on the internet. It’s the one stop internet advertisement shop for the musician with access to facebook, twitter, myspace, wordpress, yahoo, blogger and more. Post one update and it goes to all your different sites – all at the same time. No more jumping from site to site trying to figure out their weird individual quirks. This seems to be a recent trend amongst websites designed for musicians and we gotta say – we like where it’s going. We’ve already found some great new music on this site. Discovered Bang Bang Rouge on ReverbNation. This industrial, electronic dance group is quite good. You should really give them a listen. Some tracks are reminiscent of Portishead. It’s really great stuff. Give us a visit at ReverbNation and tell us what you think of our new home. Thanks and we love you all. New years eve was a nightmare. I went to bed at about 6am after working on this song all night and then woke up around noon on new years eve to give it a fresh listen and submit the song into the contest. December 31st was the deadline for the contest …. and yes, we waited until the final day to submit the song. We’ll be entering this song into a Tunecore.com contest. Winner will be featured on the upcoming soundtrack for the movie FIX (a documentary on Ministry). Former Ministry bassist Paul Barker will be picking the best song. No pressure – right? So here it is – DEADLINE DAY – I give the song a listen – make some final tweaks to the mix – and go to submit the song to tunecore / itunes. Keep in mind folks – I had very little sleep. I somehow missed the part on tunecore’s website where I was supposed to enter the code ministry. This probably flags the administrator to put your single into the contest. Naturally, upon realizing my mistake, I try to contact tunecore to fix the problem. Unfortunately, it’s new years eve and they are closed. Can’t reach them on the phone or via email and they won’t return until January 3rd. OH NO!!! According to tunecore’s website the contest is judged on January 2nd. Now – I PANIC!!! In my sleep deprived state I panic. After screaming at my computer and getting no response I make a phone call to Sarah and we decided to simply submit the song a second time under a slightly different name. Psalm 69 – ReWired Sheep became Psalm 69 – Sheep ReWired and this time we submitted it into the British iTunes store rather than the American iTunes store (where we submitted originally). This time I actually got the code in and all was good in the world. We lost an extra 10 dollars but it was worth it. A lot of hard work went into this track and I wasn’t willing to give up on an opportunity for Paul Barker to hear our track. We’re very happy to have had a chance to work on such an amazing song. This has been an experience I won’t soon forget – even if it was an extremely stressful one in the end. I want to thank tunecore.com and Paul Barker of Ministry for giving us this chance. I haven’t found anything on tunecore that says when they will announce the winner of this contest but rest assured we will keep you updated. Wish us luck. And to our fans – thanks for all your support. Here are the FINISHED LYRICS for the re-imagined PSALM 69 song we’re going to be submitting into this fine contest put together by Tunecore and Ministry. We’ve only got until friday of this week to finish this track so we’re working hard to pull it all together. Working on this track – I’ve been surprised to find that I misunderstood many of the samples. For instance – what I thought was “fire – god’s dreamer” is actually “liar – blasphemer”. How did I screw that up? I’m working on the vocals now so you can expect to hear something new and exciting tomorrow. It’s really almost done!!!! Can you hear me brother? Do you bear the mark? Here are some working lyrics for the re-imagined PSALM 69 song we’re going to be submitting into this fine contest put together by Tunecore and Ministry. Still no chorus worked up but definitely have a concept of what we want to do with that. Oh, we should have a third verse very soon. Be patient. I figured you guys were tired of reading about Julian Assange in our blogs but look – SUPRISE – I included him in these lyrics. Well, that’s it for now. Should probably get back to work and finish writing these lyrics so we can have this done before the end of the month. So … what do you think of the lyrics? Haven’t posted anything from the Tech Messiah recording sessions in awhile so we thought we would give you some of the newest stuff that we’re working on. Here’s a couple of brand spankin’ new tracks that need a whole lot of work. They aren’t complete songs yet so there will be a rather abrupt fadeout when they end but we wanted to give you something juicy and let you know that we are still hard at work on this album. Give them a listen and then tell us what you think. The first track – love where that one is going. The second track – not so much so but it might grow on us. Please give us your opinion on these new songs. Thanks. Love you all. We want to give a special shout out to Wayne for listing our cover song of the Pet Shop Boys “It’s A Sin” on his Pet Shop Boys fan site. You can find the reference to ED on the following page. Scroll down to the covers of “It’s A Sin” and you’ll find us near the bottom of the list. When a guy this into the boys tells you he likes your stuff it means a lot. Thanks Wayne – and thanks again for the kind comments you had about the “Black & White” song as well. And now here is the old school iTunes ad. Pssst ….. amazon is cheaper. Brian reports on the recording of the TECH MESSIAH album. Wanna hear a BRAND SPANKIN’ NEW SONG from the Euphonic Dissonance crew? Well, you’ve come to the right place. Brian has just finished the groundwork for a new song that is temporarily being called zippityzipzip. Yeah, there is no method to this naming of temp tracks thing. Get used to it. Sarah said the bridge has ring of Boards of Canada. That’s nice. What do you think it sounds like?